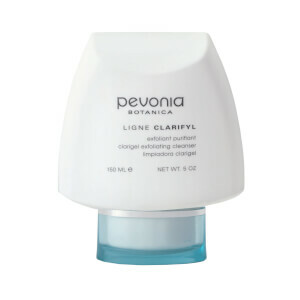 This non-drying, sulfate-free formula keeps pores clear and smoothes rough skin, creating a healthy, radiant complexion. This cleanser gently polishes your face with its unique creamy, granular texture. Precise formulation of Jojoba Beads, Saponaria, and Chamomile for a clean and smooth complexion. For all skin types especially those with flaking, skin roughness and clogged pores or for simply smooth and bright skin. Apply a small quantity of the Gentle Exfoliating Cleanser over your face and neck and work with wet fingertips. Rinse with warm water and towel dry. Follow with any Pevonia Lotion according to skin type. I have used this product for 20 years and love the way it makes my skin look and feel. This is a light exfoliator that cleans the skin well without stripping or drying. I have combination to sensitive skin and it doesn't irritate my skin at all. I'm happy with it and would buy again. Only con is the price, but it seems to last awhile. I really like this product. I have sensitive skin, and this is one of the few exfoliating scrubs/cleansers that doesn't irritate my skin. It feels gentle, and when I rinse it off and pat my skin dry, my skin feels so soft. I use it in the shower before shampooing so I can make sure I rinse all the particles off my face; and end up using it on my neck and shoulders too. Very nice product and it has a pleasant smell too. It seemed okay. Didn't really see any improvements but it also didn't irritate and I have sensitive skin. This product rocks. People have stopped me to ask what I'm doing different. It actually is helping my 15yr old with his acne! Soooo many products I have tried THANK YOU! I have used this product for over 5 years now and can't live without it!